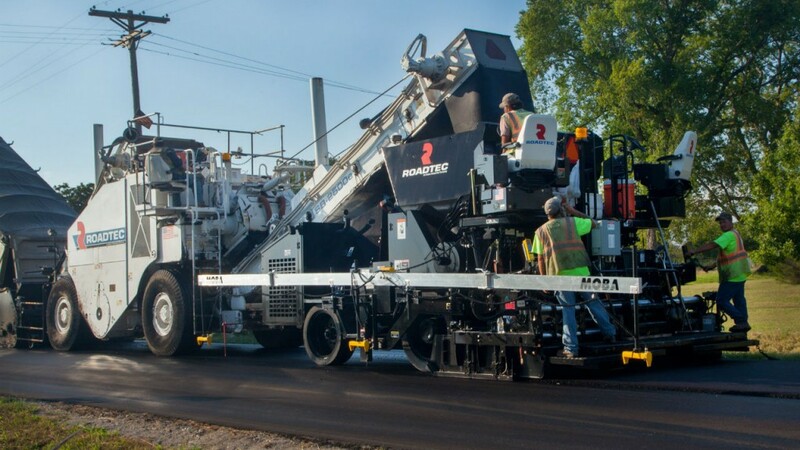 Roadtec says that the Stealth Paver is easy to operate from either side. Eric Baker, director of marketing and sales support, said, "The SP-100's streamlined design delivers a consistent product and easy maintenance while decreasing costs. Each of these translates to increased profits for our customers." • Consistent product: Works in tandem with the Roadtec Shuttle Buggy MTV. Since the material is fed directly to the auger from the hopper, risk of segregation is lessened. The 11-ton-capacity hopper's side chutes prevent buildup, and electric flow gates to enable precise control material flow. • Lower cost of ownership: Harnesses gravity's natural force to feed material directly into the auger, eliminating need for wear parts such as push rollers, slat conveyors or tandem bogies. Using gravity also reduces machine stress and wear. • Easy maintenance: Maintenance and inspection areas are easily accessed from doors on the sides or the top of the paver. The lift hood is powered hydraulically, with a manual lift backup. • Improved sight lines: Easy operation from either side of the paver. Operator platform swing-out stations facilitate clear and wide sight lines, and operators sit higher than in other pavers.